Before the coming of the Opera House Australia’s premier concert venue hall was Sydney Town Hall, still the home of the world’s largest pipe organ although the one in the new building also has a claim. Something larger was required and opposite the Harbour Bridge was the perfect site, once Fort Macquarie from the early days of the settlement and in the first half of the 20th century a tram depot. Officially called Bennelong Point, and named after a native Australian who was taken to England to meet King George III, it was also adjacent to Circular Quay, home of the harbour ferry fleet and the commuters’ way into the city. A perfect setting. An international design competition was launched in 1955 and won by the Danish architect Jørn Utzon, his the 218th submission of 233. In fact the design was initially rejected but eventually was the unanimous selection of the four man Opera House committee. What followed was a cost and building overrun which, mixed with politics, in some ways developed into a farce. Utzon walked out of the unfinished project in 1966 and died in 2008 aged 90 never seeing the completed work. Instead of four years to build it took fourteen. The original cost estimate was AU$7m. The final bill would come to AU$102m and it was largely paid for by a State Lottery in just 18 months after the opening. Utzon was not invited to the opening by Queen Elizabeth II in 1973 but did receive the Pritzker Architecture Prize, architecture's highest honour, in 2003. There was a reconciliation but by then travel from Denmark was out of the question for the elderly designer. Today his son Jan is a consultant to the architectural board of the Opera House as it approaches the 50th year since the opening. Ten thousand workers were involved in the construction but there were no fatalities during the building. The one million self-cleaning tiles covering the roof came from Höganäs of Sweden. Paul Robeson was the first person to perform at Sydney Opera House. In 1960, he climbed the scaffolding and sang Ol' Man River to the construction workers as they ate lunch. One problem that is still with us is with the Joan Sutherland Theatre and its narrow wings off-stage. For certain ballets the performers have to be very careful when flying into this area. Netting is supplied to stop accidents. When it became a UNESCO World Heritage Site in 2007 it was only one of two in honour of a living architect. The Utzon Room, a small multi-purpose venue serves as a reminder of who conceived the unique shell-like sail concept. It is one of the great iconic buildings of the 20th century, an image of great beauty that has become known throughout the world – the symbol of Sydney. 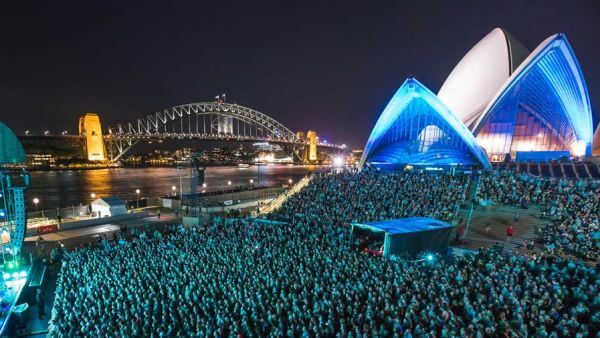 To admire the Sydney Opera House you don’t have to go to an event. You can stroll around and perhaps stop for a beer or eat at one of the food outlets. Or you can take The Tour lasting about one hour (A$40 less 10% on-line, running throughout the day and often fully booked). Half a million people are expected to do so this year, or join the Backstage version (A$175) and taking two and a half hours but that starts at 7am and does include breakfast. The tours themselves are well organised, but are pacey and do include quite a lot of steps. On the short version there are two video stops and the guides excellent and full of interesting facts. Except for the boxes in the actual opera theatre all the sight lines are good, the seats themselves designed in such a way that they acoustically act as if being sat on even when empty. During rehearsals the performers will not notice the difference regarding the sound effect. In recent times the stages have been full mechanised. Previously some of the sets had to be dropped in by a pulley system. 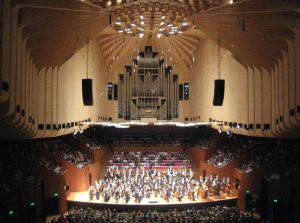 Sydney Opera House is not just an opera house (and the Joan Sutherland Opera Theatre with 1,500 seats is smaller than the 2,679 capacity Concert Hall). It is a performing arts venue, the largest in the Southern Hemisphere. 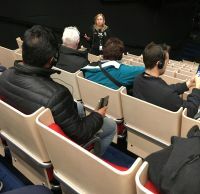 There is the Drama Theatre, a traditional proscenium arrangement used by the Sydney Theatre Company and other dance and theatrical presenters: The Playhouse, a more intimate open theatre with room for 398 persons, and The Studio with 280 permanent seats and a 400 capacity. Not to be missed is the aforementioned Utzon Room with its floor to ceiling, 14m high wood tapestry designed by Utzon himself. Facing Circular Quay the Forecourt, a wonderful open air venue much used for pop concerts, and also for seeing in the New Year. There are six restaurants dotted around the building. Eight million people annually visit the Opera House and its precepts making it one of the most popular attractions anywhere in the world. Well done Mr Utzon.